In the aftermath of the Great Armenian Earthquake, little Maria was born into a world where hope was only a distant memory. But hope is what her mother had to give, as she left her precious baby in the hands of an orphanage doctor in the small Russian town of Armavir. Halfway around the world, Tony and Marsha Woods, still grieving from the loss of their first-born son but clinging to their long held hope for another child whom they could love and cherish, were led by a series of miraculous events to Armavir and to the amazing Dr. Vegislav. Together and against all odds, they accomplished the impossible. 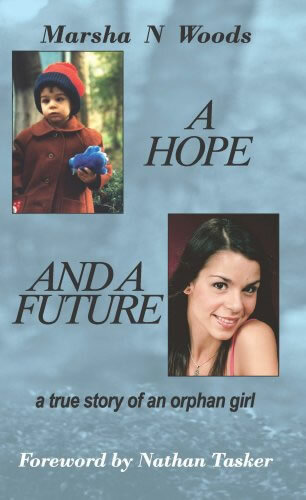 This is the true story of an orphan girl’s journey from desolate beginnings to the life of an American “missionary kid”, finding her home in such places as Japan, Hong Kong, Ethiopia and Australia. But most important of all was her discovery that the words of God through the prophet Jeremiah were hers to claim as well: “For I know the plans I have for you… plans to prosper you and not to harm you, plans to give you hope and a future”.